The holidays are a popular time of the year for parties, and sometimes it can be hard to figure out what is appropriate to wear. If you’re lucky, the invitation will include the intended dress code, but you still have to interpret what they mean. If the dress code is “Business,” they generally mean business formal. For women, this means a suit, a work-appropriate dress (think Fortune 500 company, if you’re not sure what “work appropriate” means – knee length, not too low), and heels (low or high). Stockings are likely appropriate as well. For men, this means a dark business suit, dress shirt, conservative tie, and leather dress shoes. Please, please – dark socks only! No white socks with your business suit. If the dress code is “Festive Attire,” think a step down from semi-formal or cocktail. Holiday colors are appropriate. For women, this could be a cocktail dress, dressy skirt or pants and top, or little black dress. For men, it’s more relaxed than business – a blazer or sports coat and slacks with an open-collar or dress shirt, and festive tie is appropriate. If the dress code is “Black Tie,” the hosts are hoping that you will dress up. For women, plan on a floor-length evening gown, dressy cocktail dress or a dressy little black dress. For men, wear a tuxedo with formal shirt, black bow tie, and black vest or cummerbund. Black patent shoes and black socks finish it off. If the dress code is “White Tie,” the hosts are wanting a very elegant affair. For women, this means a floor-length evening gown and optional long gloves. For men, this means a black dress coat with with tails with matching trousers with a single stripe of satin, white wing-collared shirt, braces, white vest, white bow tie, white or gray gloves, and black patent shoes and black dress socks. For both black and white tie, if wearing a tuxedo, men should also plan on wearing shirt studs and cuff links. 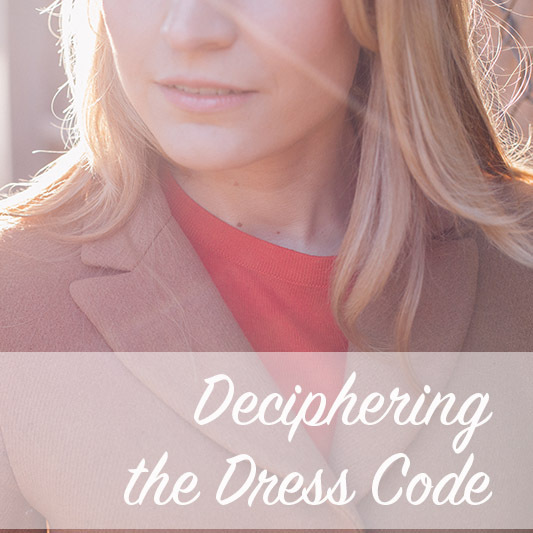 There are some generalities to consider – generally the south or east coast will have a dressier interpretation of these dress codes. The west coast (where I live) tends to be a lot more casual. If in doubt, however, lean toward the dressier interpretation. It’s usually better to be a little overdressed than underdressed for most occasions. What are the dress codes you tend to come across at your holiday parties?